It was January, 1991 (Summer south of the bulge) when I met Chilean strongman Augusto Pinochet. We met in Brazil. Seven years later he would be arrested while on a medical visit to Europe and placed under house-arrest by order of the World Court for his presidential policy of throwing Chileans out of airplanes over the open Sea, and other such un-niceties. The U. S. A. is widely credited with the 1973 coup d'etat that took out the elected President Salvador Allende, replacing him with Augusto Jose Ramon Pinochet Uguart, more commonly known as General Pinochet. I had arrived at Ipanema's Hotel Sol two weeks earlier, after a long flight from New Orleans. I had arrived with a belly full of whisky and a bleary mind. We came down through the clouds over the new city of Brasília, at the time, the largest city in the world that did not exist at the beginning of the 20th Century (2.5 mil, give or take). Viewed from above, the main portion of the city resembles a butterfly, some say. Others say it looks more like an air-craft carrier. L. A. Norma says, "One might deduce political inclinations from which you see." Brasília is a Unesco World Heritage Site. Planned and developed in 1956. Lúcio Costa was principal urban planner; Roberto Burle Marx landscape designer, and the great Oscar Niemeyer the principal architect. Niemeyer was one of the 20th Century's soring young architects. Brasília gave him wings. He died in 2012, at 104. He was blocked from entry to the United States to teach at Harvard, because of Communist Party membership. (After World War Two, America's state religion became anti-Communism, and its zealots greatly feared Commies going to Harvard). On April 22, 1960, Brasília became Brazil's national capital, wrestling the honor away from its ancestral home in coastal Rio de Janeiro -- a city with much kinship in music, dance and doom to coastal Louisiana. Naturally this move chagrined the world's diplomatic corps and their attendant camp followers. Greeting me at Rio de Janerio's Aeroporto Galeao was an aide to the United States cultural attache. He carried a small, white box with a red silk ribbon that I presumed was for me. But let us face it, I was drunk. He placed me and the box in the rear seat of a large Chevrolet, where the box remained when he departed. It was early morning. The ambassador still slept in his jungle apartment in Brasília The cultural attache was doing likewise somewhere in giant Rio, and I stood beside their aide with my eyes twirling in front of the Hotel Sol's desk clerk. The aide explained to the clerk, "Mr. Johnson is more important than he looks." And so I was. I was traveling at the expense of the United States government and American Airlines, exhibiting photographs and teaching a workshop at the nearby Casa de Cultura Laura Alvim, on the beach at Ipanema. The exhibition was titled "Bourbon Street and The Sea." It was inspired by John Ernest Joseph Bellocq (1873~1949), a New Orleans photographer who immortalized the ladies of Storyville. My exhibition consisted of portraits of male street walkers in the French Quarter, and merchant seaman around the world. "America's foreign policy is a baffling beast," L. A. Norma likes to point out when this story comes up in conversation. The exhibition went well, and at the reception afterwords I asked the American Airlines' South American Manager if I might bump up to first class on my return flight. The aide to the cultural attache said to me aside, "They don't even do that for us." The South American manager suggested I come see him the next week at his downtown offices near the Old Opera House. I had already asked the embassy for an advance on my State Department stipend. With it I paid for my extended weeks at the Sol. Next morning, along Ipanema's beaches frolicked the song-praised "young and sweet / pure and gentle," dressed as revealingly as young and sweet should. Me? Hungover and of a girth not comfortably given to bodily revelations, I walked on with a sigh. At the Veloso Bar, I sat sipping Wild Turkey and wearing snowflake-looking, tie-dyed navy and gray boxer-baggy trunks with a matching hip length beach jacket. This outfit had been sewn for me especially for this trip by an Uptown New Orleans matron. On the day I met Pinochet I was also so dressed. I had walked from my hotel along the beach to a large neighboring resort, the Caesar Park, to take coffee and the afternoon newspapers from Miami. In front of the Caesar Park this afternoon were several large German cars and one lone American Chevrolet. I glanced in the Chevrolet half expecting to see my lost red-ribboned white box, and met the glare of several large men wearing dark suits and glasses. No white box was seen. the lobby rumbled with similarly dark suited men, assorted reporters, and cameras with portable lights. I caught sight of the woman who had interviewed me for Brazil's O Globo TV, on the night of the reception. I had worn the same beach coat then -- it looked rather like an Armani design -- over a white shirt and tie. My coat looked "terrific," she had told me. Head swelling, I agreed telling her I had bought it in Lisbon (always a good lily-gilder in Brazil). I asked, "What is going on?" "We are following Augusto Pinochet on a jewelry buying stopover before flying off to South Africa for arms shopping." Just then, lights and cameras came alive in front of me. By my side stood Augusto Pinochet wearing a double-breasted pin striped suit. He looked neither large nor menacing. He looked like any Latin businessman. He looked at me, and neither smiled nor spoke. I said, "Good afternoon, Generalissimo." Perhaps not exactly correct, "Generalissimo" spoken by itself being known throughout the warring worlds as the title for Spain's famed fascist dictator, Francisco Franco. I had read it was a comparison Pinochet liked. He smiled and moved on. The crowed followed. A waiter in starched white livery brought over a cup of black coffee and the Miami Herald. Late the next morning I went to see the manager of American Airlines' South American interests. His secretary led me in and brought us black coffee and a bottle of Wild Turkey. On a large Amazon mahogany desk sat a small television with a built-in Video Cassette Recorder. On the screen was Pinochet looking at me in the lobby of the Caesar Park hotel. A voice-over, roughly translated, was saying, "Pinochet in civilian clothing and visiting North American photographer, Leonardo Arl Johnson, wearing a 'Lisbon coat,' meet in the lobby of ..."
On the flight home I sat in first class flanked by deluxe food carts, wine, whiskey and a white box wrapped in a red silk ribbon. Inside were expensive chocolates. 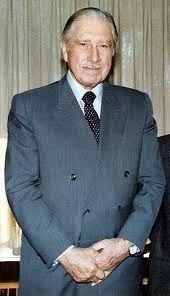 Pinochet was arrested in London on 10 October 1998 in connection with numerous human rights allegations, but following a legal battle was released and returned to Chile in March 2000. In 2004, Chilean Judge Juan Guzmán Tapia ruled that Pinochet was medically fit to stand trial and again placed him under house arrest. By the time of his death on 10 December 2006, about 300 criminal charges were still pending against him in Chile for numerous human rights violations, tax evasion, and embezzlement during his 17-year rule and afterwards. Pinochet was accused of having corruptly amassed a wealth of US$28 million or more. FYI: The new Yahoo will no longer send out my mailing list without showing each name and address to all. I won't do that, so you will no longer receive a monthly notice for YOURS TRULY IN A SWAMP. If you wish to read it you must go on your own accord to www.LEJ.org Hope you do, I love talking with you.